Today we are ready to start with the grass-roots econometric tool: Ordinary Least Square (OLS) Regression! We will revise several commands that I already described in previous posts so, in case you missed them, you have the opportunity to review them again. I am sorry but I am not going to give you a theoretical explanation of what we are doing so, if you are not familiar with the argument yet, I suggest you to check The Econometrics’ Bible: Wooldridge. I am only going to discuss some modeling strategy. One of the assumptions of the OLS model is linearity of variables. However, if we abandon this hypothesis, we can study several useful models whose coefficients have different interpretations. In this model, both the dependent and independent variables are logarithmic. In our example, I have log transformed a hypothetical writing and math scores test. In this model, the beta coefficient may be interpreted as elasticity of lwrite respect to lmath. Indeed, beta is the percent variation of lwrite associated with a 1% variation of lmath. Since this is just an ordinary least squares regression, we can easily interpret a regression coefficient, say β1, as the expected change in log of write with respect to a one-unit increase in math holding all other variables at any fixed value. This model is the opposite of the previous one. The regressor is log transformed while the dependent variable is linear. Beta can be interpreted as the unitary variation of write score respect to the relative variation of the math score. In this model, one of the independent variables is included in its square as well as linear terms. The marginal effect of age on wage depends now on the values that age takes. This model is usually described with graphs of trajectory. 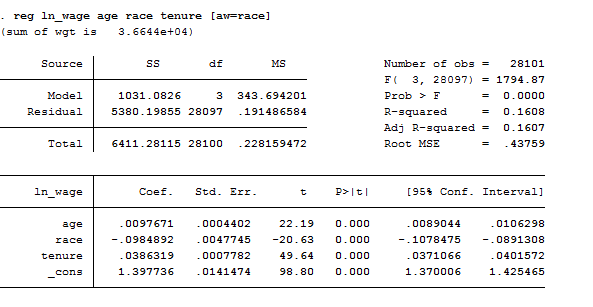 In this model, the β1 coefficient can be interpreted as the marginal effect age has on wage if race=0. The marginal effect depends on the other regressor. (i.e. Marriage premium). My personal opinion is that we should choose the model based upon examining the scatterplots of the dependent variable and each independent variable. If the scatterplot exhibits a non-linear relationship, then we should not use the lin-lin model. Given that sometimes we have huge amounts of data, this procedure becomes unfeasible. We can try to follow the literature on the topic and use the common sense or decide to compare the R-Squared of each form as long as the dependent variables are the same. You should choose the model with the higher coefficient of determination in this case. An incorrect functional form can lead to biased coefficients, thus it is extremely important to choose the right one. If you want to describe data, type describe and you will see that this is a panel data of women of 14-26 years providing information regarding their race, marital status, educational attainment and employment. I am not going to discuss panel data now but it is good if we start to know the database that I will use in the next posts to introduce panel data. 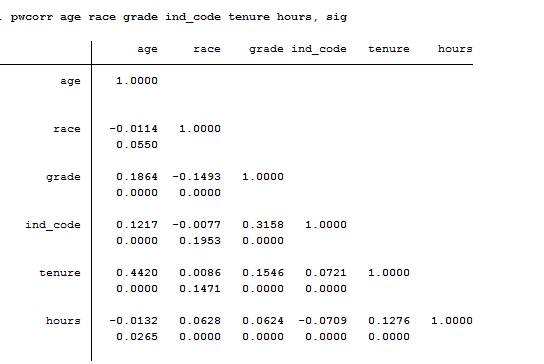 With the –regress- command, Stata performs an OLS regression where the first variable listed is the dependent one and those that follows are regressors or independent variables. 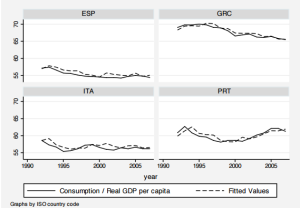 Did you miss my post on graphs and you are lost? Check it out now here. The regress command by default includes an intercept term in the model that can be dropped by –nocon– option. Other options such as beta or level() influence how estimates are displayed; beta particularly gives the standardized regression coefficient. If we want to examine the covariance matrix of the estimators to see if homoscedasticity is respected, we can add the vce() option. Once we fit a weighted regression, we can obtain the appropriately weighted variance–covariance matrix of the estimators using estat vce and perform appropriately weighted hypothesis tests using test. Regress supports also frequency weights ([fweight=age]). As we can see from the result, given that P-Value<alpha, we reject the null hypothesis that the model has no omitted variables. Thus, we need to try a different specification because rejection of the null hypothesis implies that there are possible missing variables thus the model suffers from endogeneity, causing biased coefficient estimates. As you can observe, sktest presents a test for normality based on skewness and another based on kurtosis and then combines the two tests into an overall test statistic. Pay attention because this command requires a minimum of 8 observations to make its calculations. If your regression output displays low t-statistics and insignificant coefficients it might be that, you have selected as independent variable to explain your output, variables that are perfectly correlated among them. The first thing I suggest you to do is to examine the correlation matrix between the independent variables using the –correlate-command. Even thought I was sure that our regressors were uncorrelated I checked them out. 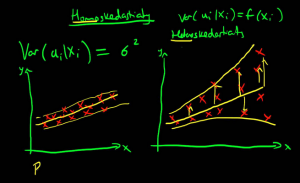 As a rule of thumb, a correlation of 0.8 or higher is indicative of perfect multicollinearity. If you do not specify a list of variable for the command, the matrix will be automatically displayed for all variables in the dataset. Correlate supports the covariance option to estimate covariance matrix and it supports analytic weights. Another useful command you must check is pwcorr that performs pairwise correlation. The correlations in the table below are interpreted in the same way as those above. The only difference is the way the missing values are handled. To compute a correlation you just need two variables, so if you ask for a matrix of correlations you could just do so by looking at each pair of variables separately and include all observations that contain valid values for that pair. Alternatively, you could say that the entire list of variables defines your sample, in that case would first remove all observations that contain a missing value on any of the variables in the list of variables. -pwcorr- does the former and -corr- does the latter. When you do pairwise deletion, as we do in this example, a pair of data points are deleted from the calculation of the correlation only if one (or both) of the data points in that pair is missing. There are really no rules to define when use pairwise or listwise deletion. It depends on your purpose and whether it is important for exactly the same cases to be used in all of the correlations. If you have lots of missing data, some correlations could be based on many cases that are not included in other correlations. On the other hand, if you use a listwise deletion, you may not have many cases left to be used in the calculation. If you don’t remember how to control if your variables present missing values you are kindly advised to read here. Too much information to digest? I hope not! Stay tuned for the next post on Logit and Probit Models.